Erik Van Dootingh, who travels to Thailand often, booked a stay at a luxury villa resort using points earned on his American Express card. His business-class flight to Southeast Asia for this trip was purchased on points, too. A: We took advantage of most of the bars and restaurants at the resort. We also made frequent use of the golf cart shuttle service from our room to wherever we were going. Due to the sprawling nature of this resort, this is a must. This trip was mostly about relaxation, and to be honest, the best part was just staring out the window at the mesmerizing view of the five islands off the southwest corner of Koh Samui. A: I traveled with my wife and daughter, who was 5 months old at the time. My parents also joined us on the trip in a separate room. This hotel has a great reputation in the travel community and the points needed to book it are relatively easy to acquire. 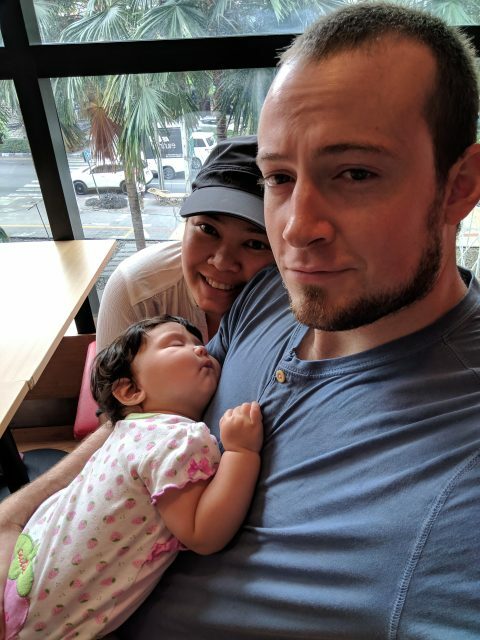 We travel to Thailand often to visit my wife’s family in Bangkok, and the resort was a short flight away. Q: What loyalty program did you use to get this stay? A: I used Hilton Honors to make a reward reservation. The points were earned primarily through grocery store spending on my Hilton Honors American Express Ascend Card. This card earns 6X points at U.S. supermarkets. Terms apply. A: I had been a cardmember for about six months at the time of booking. Q: How long were you planning this stay? A: I booked about four months in advance of the trip. Q: What are your favorite perks of this loyalty program? A: My favorite perks of the Hilton Honors program are the high earning rate offered by the credit card, and the ability to earn elite status through credit cards without any stay requirements. A: I did not take advantage of any promotions while earning or booking for this trip. A: I booked directly through Hilton since it was an award booking. A: The rate was 95,000 points per night, which is the standard rate for top-tier awards per Hilton’s award chart. A: The best part of the trip was a surprise upgrade at check-in. We were upgraded multiple levels to a two-level, two-bedroom suite. It was an absolutely massive room that was big enough to live in with a full kitchen and multiple bathrooms. This upgrade was due to being a Hilton Diamond member, a status I achieved through a credit card spend. My parents were also upgraded to the same room type only a few doors down, which was very convenient for all of us. We plan on going back to Thailand this year around August. This will be our first trip that includes our soon-to-be-born son. I plan on using Delta Global Upgrade certificates for half the flights and will book the return flights with another program, likely using Alaska Airlines miles or AmEx Membership Rewards. Photo via Erik Van Dootingh.